Web Quiz Tells You Which Presidential Candidate Best Fits Your Worldview : It's All Politics An interactive Web quiz purports to show you which presidential candidate's views most line up with yours. It's the creation of two guys who want to encourage more political engagement. The quiz can produce some surprising results. 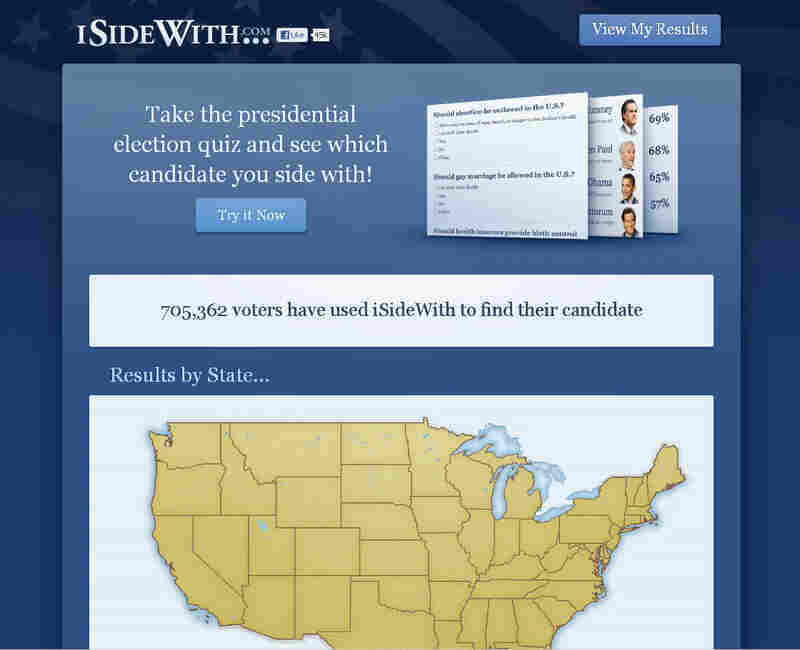 Take one guy with an abiding interest in politics, another guy with website-building skills and throw in the shared desire to get people more engaged in the political process, and you have the ingredients for an interactive site called ISideWith.com. The site's purpose is to show you which presidential candidate's views most align with yours by running you through a short quiz that asks your stance on various policy issues, then determines which candidate most agrees with you. It's not a new idea — similar quizzes popped up the past few election cycles. But what sets this one apart is the social-media angle: The site allows you to share your results with your friends or to comment via Facebook, and it shows you the states where candidates best match up with the quiz takers. This last feature leads to some interesting results. No surprise, President Obama has the highest percentage of quiz takers agreeing with him in California, Illinois and New York. But here's a twist: Gary Johnson, the Libertarian Party presidential candidate and former New Mexico governor, has the highest percentage of quiz takers agreeing with him in a number of states that are likely to go for Mitt Romney come Election Day, including Texas and Georgia. "I'm a political news junkie. I've been discussing politics, following politics since I was 5 years old. ... He was kind of not interested in politics at all, typical of the undecided American voter, where I was consuming political news 24-7. "So the idea came out that we wanted to have a medium where people like he and I could really communicate our views and kind of share where we side on different issues and which candidates we kind of agree with the most. "So we wanted a tool for people like us to communicate and also why not our family and friends. So we kind of toyed around with it for a little while and we launched and got out a beta in April." The counter on the site indicates that almost 750,000 visitors have taken the quiz so far. So far, the metrics indicate that younger visitors, those between 18 and 30, are less patient in answering the questions but more willing to post their results on social media. Visitors over 65 are just the opposite — more patient in taking the quiz but less likely to share their results. "All of our traffic is coming from people who are just kind of sharing their results online through social media. And then their friends are coming to take our quiz and they're sharing their results with 100 people, then 20 of those people end up taking it. So it's kind of just exploded virally." The site's creators have so far paid for it mostly out of their own pockets, Peck said. (They do solicit donations through a PayPal button.) For now, the site doesn't have ads because they don't want to turn visitors off or distract them as they take the quiz. Peck, the political junkie, researches the candidates' issue positions and says supporters of the various candidates are quick to point out his errors. "Jimmy McMillan, he's firing on all cylinders. I included him because he's a colorful character and I got to interview him. He had some positions that the other candidates don't have. So we included him because we just wanted to give him some exposure because the media kind of ignores him." Peck, who clearly sees the humor in politics, muses that there should be a place for the quiz in the presidential selection process. "Whoever gets the highest score gets the nod." Seriously, he wants to add some more voter-engagement features to the site in coming weeks. For instance, he would like to add some buttons that would encourage people to register and vote and donate to or volunteer in campaigns.